1. Blogs and Websites. Check out my blogroll for some. Some of these are fairly new, some have been around a while and have great stuff in their archives. Yep, there are a lot out there–there’s probably one or two that fit your style of preparedness or whose authors are doing what you would like to try. 2. Books, e-books, and magazines. 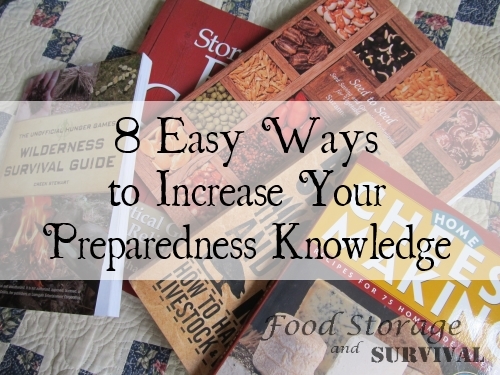 It seems there is no shortage of books on all sorts of skills related to preparedness from your basic survival guides to books on making cheese and raising and butchering animals. Check reviews, use Amazon’s “look inside” to see the table of contents and first pages to see if it has the information you want. You may even be able to check out the book from your local library instead of buying it. 3. Podcasts. Podcasts are a great way to sneak learning into the times when you’re doing something else like driving or washing dishes. I have a weekly podcast, and for some other great options, check out the rest of the Survival Mom Radio hosts, the Survival Podcast, and the Preparedness Radio Network. 4. YouTube. Some things are just so much easier to understand if you can see it done. YouTube is full of fantastic preparedness channels covering all aspects of preparedness from firearms to gardening. Here are a few of my favorites: Yankee Self-Sufficiency, Reality Survival, Survival Common Sense, LDSPrepper, The Survival Mom, and of course my page. Don’t forget to subscribe to the channels you enjoy so you’ll get notified when they have new content. 5. Preparedness Fairs and Expos. I love preparedness fairs. Depending on who is putting it on and what they have planned they can be very educational. Sometimes there are classes, other times it is mainly booths with preparedness vendors and information. Most times you can get some good information. Sometimes you can pick up a good deal on the preparedness products you’ve been wanting to buy at a fair, but check your prices before you go so you know what’s a good deal and what isn’t. Some fairs are free, some have an entrance fee. Consider that fee and your gas/travel expenses if you’re going just to purchase something–you may get a better price purchasing somewhere else or ordering online–make sense? 6. Seminars and Classes. Check out your local extension office for classes on food preservation, gardening, raising animals and more. You could also volunteer for the local scout troop or 4H group and get some valuable education for free. Sometimes people in the preparedness community will put on classes. Keep an eye on your newspaper or other source of local happenings to see if any classes are scheduled near you. You can also find online seminars called Webinars that are like taking a class only it is broadcast over the internet, so you can attend in your pajamas because nobody sees you. Most times the presenter will be visible on video and there may be a powerpoint to watch with the information they are covering. If you are joining the webinar live, you’re usually able to ask questions via a chat system. Some are only live and others are recorded and can be watched anytime. 7. Friends and Family. This may be a bit obvious, but it’s okay to reach out to others around you that have skills you want to learn and ask for help. I don’t know anyone who knits or crochets that wouldn’t be glad to help someone else learn. Same with canning or gardening. Okay, some people might just want to be hermits and not share their knowledge, so just skip them and ask someone else! 8. Experiment. If you can’t find the information you want, and even if you can, test it out yourself. This is the best kind of learning for most people. 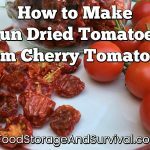 You get to see how sprouting wheat works in your environment or what kind of extra warmth you want in your sleeping bag if you’re camping on a cold night. Don’t just take other people’s word for things. After you learn what worked for somebody else, test it out yourself and see if there are things you’d change or do differently. How about you? What opportunities do you see for increasing preparedness knowledge? While there are indeed a plethora of new books on the market dealing with the unfolding crisis, and many deal with it from various angles. I’d like to recommend the book, “DISCOVERY TO CATASTROPHE,” by Wood. This book is particularly interesting as it approaches what is happening, and what will soon happen from a biblical scenario. Wood’s second coming of Christ discussion, written in fictional form, comes at the reader much like the Left Behind series, but in a more biblically honest way – at least in my opinion. The first third of the book shows the struggles of one man (later a small group) with biblical truth regarding Christ’s return. While the second two thirds of the book is much like a preppers manual. One thing it deals with well is the idea of community. I think it handles this issue in a sound well reasoned manner. Enjoy, and keep on prepping!